Once again, OPIN is honored to have been asked to march in this year's Stamford St. Pat's Day parade to be held Saturday, March 5th. Come and enjoy the parade! Find 'The One' in Time for Valentine's Day! Looking for Love That Lasts? OPINPets and Best Friends Animal Society Can Help You Adopt a Pet to Realize Those #RelationshipGoals. OPINPets, Best Friends and Hallmark Channel Team Up to Encourage Everyone to Swipe Right to Find "The One" at National Pet Adoption Event Stamford, CT - HAPPY VALENTINE'S DAY! Oh. Now the bad news... As sincerely as we try, statistics show that being consciously coupled is often fraught with failure. According to bestselling author Hellen Chen, more than 85 percent of dating relationships end in a breakup. Not to mention, nearly a third of marriages end in divorce. But don't fret, there is a way to set realistic #RelationshipGoals this year: Ditch the dating and adopt a pet. When looking for love, you're more likely to find the real deal at OPIN than at your local bar, or on Tinder, or Ashley Madison for that matter. Just for starters, about 81 percent of people on dating sites and apps lie about height, weight or age in their profiles (according to a University of Wisconsin-Madison study). But dogs and cats don't lie about tail length or being housebroken, what you see is what you get. Instead of roses this year, OPIN is joining Best Friends Animal Society's national Valentine's Day adoption campaign, "The One". OPIN is an active partner in Best Friends No More Homeless Pets ® Network which offers help and support to animal rescue groups that save lives in their communities. Sunday, Oct 18th, Powder Puff 2: Brunettes vs Blondes! Every year, a group of young women battle it out in a Powder Puff Football Charity game! 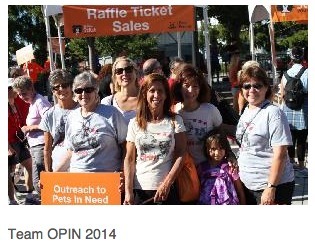 For a second year in a row, the girls will be supporting and raising money for OPIN (Outreach to Pets in Need). Your donation will help Astro, a 5-month old pitbull; who was recently hit by a car. With no funding allocated for surgeries, a Connecticut high kill shelter would have put him down. Then OPIN came to his rescue! Astro is in good care now after receiving hip socket surgery, but he still needs to be watched. They're hopeful that his surgery will be a success. Astro is currently up for adoption and looking for a good home. The funds raised will not only help Astro, but the next critically ill pet in need of urgent care. Please make a small donation online today, or on game day by credit card, cash, or check. The event is public, so please invite your friends, loved ones, and bring your pets along to come watch! Astro will be waiting to meet you. 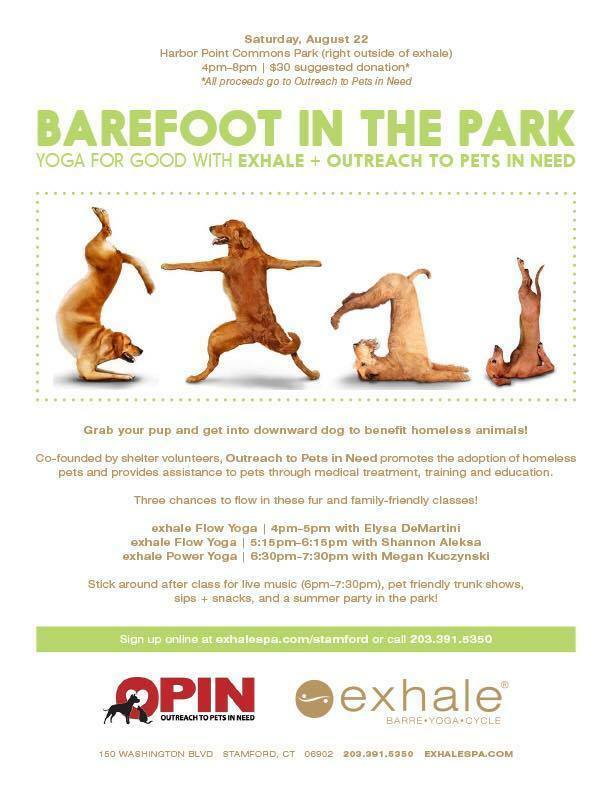 What: Please join us for an afternoon of fun, courtesy of Exhale Yoga. Take a yoga class, enjoy the live band, vendors, beautiful scenery at Stamford's best view- Harbor Point!! Thank you Exhale for caring about the community pets in need! 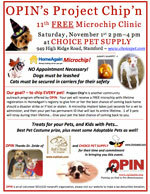 4:00-6:00 PM FREE MICROCHIP PET CLINIC- Dogs must be leashed- cats in carriers- No appointments needed. Harbor Point Commons Park across from Exhale Yoga. What: Enjoy a Hockey Game, Animal Related Vendors and Adoptables. Hurry: The deadline to sign up & submit your photo is April 14th! 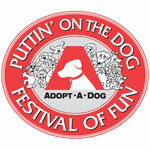 More: Mention OPIN in the seating request field at sign up and Pinot's will donate $5 per person to OPIN SIGNUP HERE! More: Your pet has lots of personality, so why shouldn't his portrait? This is the perfect chance to show off how fun your fur baby is on the inside by painting him in bold, psychedelic colors! Think gift for upcoming Mother's & Father's Day. 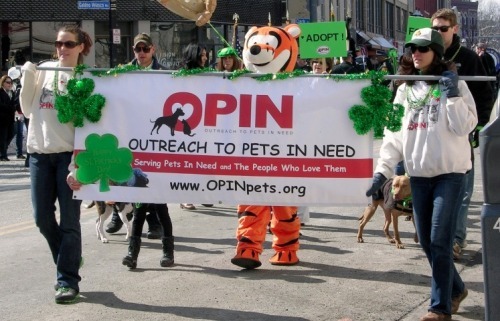 Checkout photos of Outreach to Pets in Need (OPIN) marching at St. Patrick's Day parade in Stamford, Connecticut! Have you ever dreamed of finding “the one?” You know, that special one who melts your heart from the moment your eyes meet? Someone you know you just can’t live without? Well, dream no more. This Valentine’s Day weekend (February 13-16) during Best Friends “The One" adoption promotion, adopt your special “one” for just $10. Whether you’re looking for a cute cat to cuddle with on the couch or a loveable dog to have fun with outdoors, we know there’s a special animal who thinks you’re "the one," too. You can find him or her at the Adoptables area here. 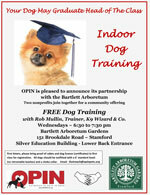 FREE Dog Training at Bartlett! FREE Dog Training at BartlettFREE Dog Training with Trainer Rob Mullin of K9Wizard & Co.
OPIN is pleased to announce this partnership with the Bartlett Arboretum;without their help we couldn't offer this service year round. Classes are open to everyone and are held every Wednesday night (6:30-7:30 pm). Your dog will learn the basics: to walk nicely on a leash, to sit, stay, down, and to interact positively in the presence of other dogs. 151 Brookdale Road, Stamford CT - Map! What: Shortly after taking office, Mayor David Martin announced that he would hold open monthly meetings with residents to allow them the opportunity to meet with directly with he and members of his administration to share their ideas and concerns. More here. 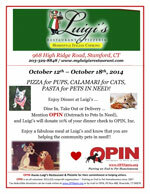 Oct 12th-18th: Luigi's Presents - Pasta for Pets in Need! What: Enjoy Dinner at Luigi’s ... Dine In, Take Out or Delivery… Mention OPIN (Outreach to Pets In Need), and Luigi’s will donate 10% of your dinner check to OPIN, Inc. Enjoy a fabulous meal at Luigi’s and know that you are helping the community pets in need! !